The Western Movie Matinee Series, a collaboration between Oklahoma City University and the National Cowboy & Western Heritage Museum, will continue the second half of its season with “Red River” at 1 p.m. Sept. 26. Popcorn will be provided, and museum admission is free to all on Wide Open Wednesdays courtesy of the Oklahoma Ford Dealers. The movies are screened free to the public in the Dub and Mozelle Richardson Theater at the museum, 1700 N.E. 63rd St. 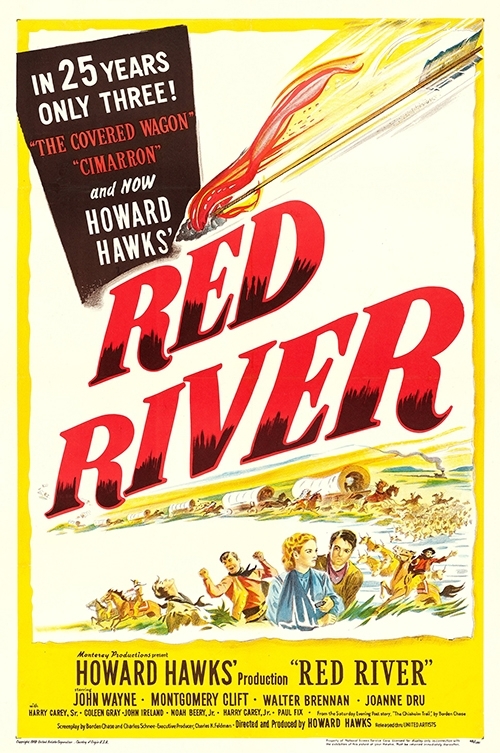 Directed by Howard Hawks, “Red River” portrays the epic journey of a cattle drive along the historic Chisholm Trail to Abilene, Kansas. It is considered one of the best Western films, and many critics say it established John Wayne as a great actor. “Red River” introduced Montgomery Clift and illustrated the psychological complexity between the two figures they portray. The film has not been rated and is appropriate for ages 16 and up. Harbour Winn, former director of OCU’s Film Institute who is curating some of the films in the series, said “Red River” is noted for its Biblical and Homeric parallels. “In the dramatic clash that the film relentlessly moves to, we watch nervously as the present and future depend on what kind of leader will take this country forward, tension that still reverberates in our own time now,” Winn said. The museum is hosting the series for its third year. Inez Wolins, the museum’s chief public experience officer, contacted OCU’s Center for Interpersonal Studies to collaborate and introduce larger humanities themes and topics through the screening of popular Westerns. The series also benefits from a recent significant donation from an anonymous donor. While the OCU Film Institute has always been international in focus, both the past and current series directors have backgrounds in films and literature of the American West. The film institute’s current director, Tracy Floreani, and former director, Harbour Winn, are curating some of the films in the four-month series. Film historian Elizabeth Anthony, president of Reel Classics, is curating the rest. The matinee series will run through Nov. 14 at the National Cowboy & Western Heritage Museum. Upcoming screenings will include “McCabe & Mrs. Miller” on Oct. 3, “Bonnie and Clyde” on Oct. 10 and “Tomorrow” on Oct. 17. For more information, visit nationalcowboymuseum.org/movies; or call 405-478-2250 ext. 344.